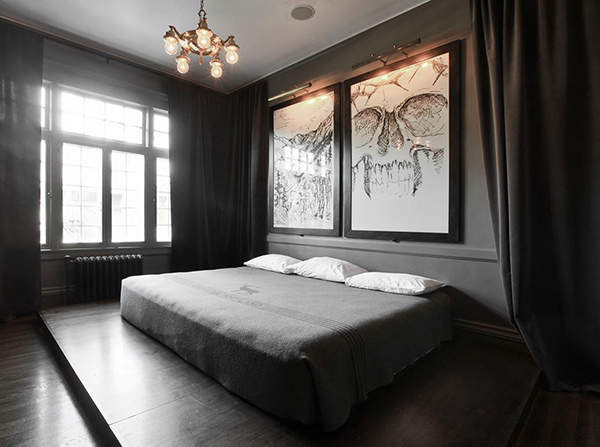 Beautiful bedroom walls create different moods. The kinds of decorations you put on your bedroom walls define your personality. 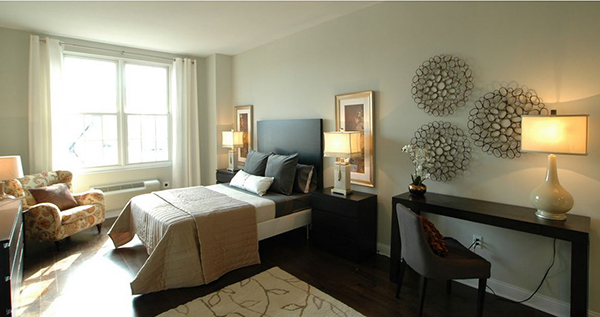 It will also project the atmosphere you want to feel in your bedroom. Wall decors can make or break the style you want to achieve. It is important that you put into consideration what kind of appeal you want to have. The kind of furniture and furnishings that you already have in your bedroom should complement the wall decors that you want to install on your walls. If you are looking for solution to revamp your blank bedroom walls I got it here for you. 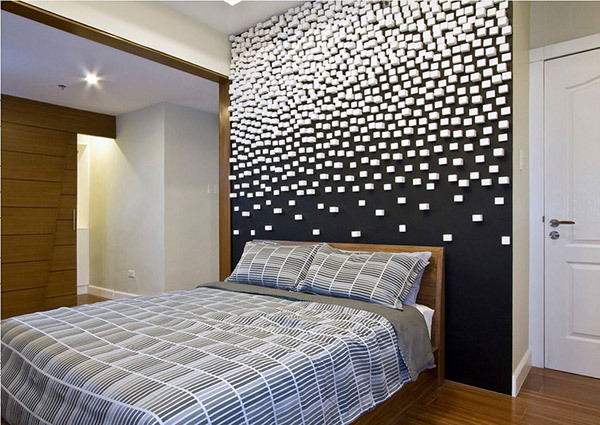 Below are 20 Bedroom Wall Decorations that will help you in filling those blank spaces. It is a combination of DIYs and things that you can buy from shops if you do not have the time to do some crafting. The list ranges from a master bedroom wall ornaments to kids bedroom wall decorations. Browse through it and see what kind of decors you should use for your own bedroom walls. The blank walls were made exciting and modern by using a DIY sculpture from the Nasher Sculpture Center. It is made of interlocking plastic pieces that can be rearrange anytime you like. I love the colors gracing on this bedroom walls. The combination of aqua green and beige create that beach atmosphere. 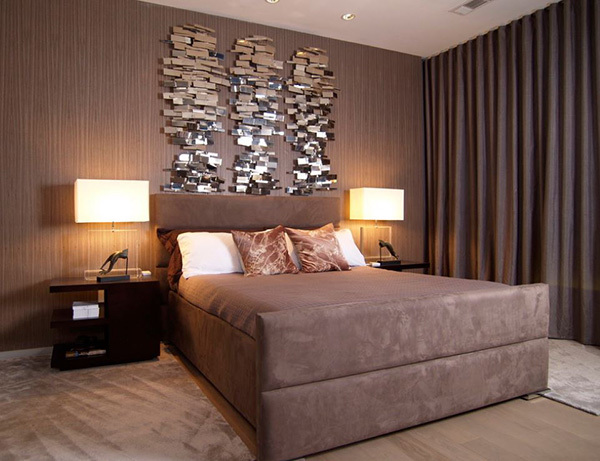 The usage of wood art and mirrors on the accent wall makes a stunning effect. You will love this simple DIY for the bedroom wall makeover. Easy, cheap and does not need a lot of work from you. Play around with framed artworks and mirrors and you might get the same fabulous appeal like this one. 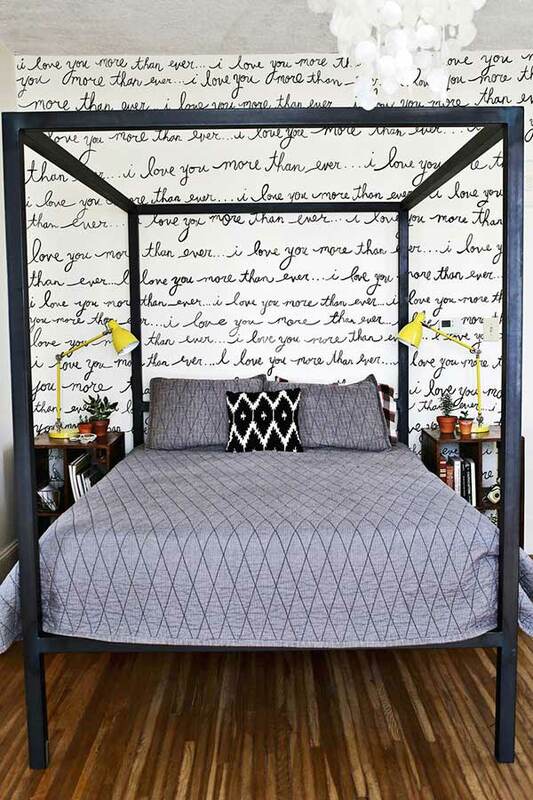 This is another brilliant idea to fill your bedroom walls to make it instant cozy. Fill your walls with hand painted statement of your choice and you may get the same refreshing yet intimate mood in your bedroom. The purple large scale artwork creates a dramatic flair to this bedroom. 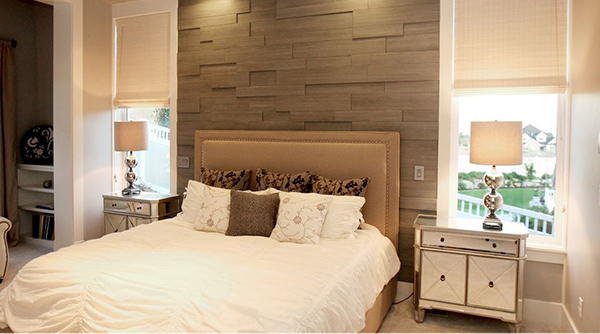 The gorgeous white tile decor against the accent wall makes a lovely contrast creating a luxurious feel in the bedroom. I love the chic wall cluster! It keeps the room stylish and modern. 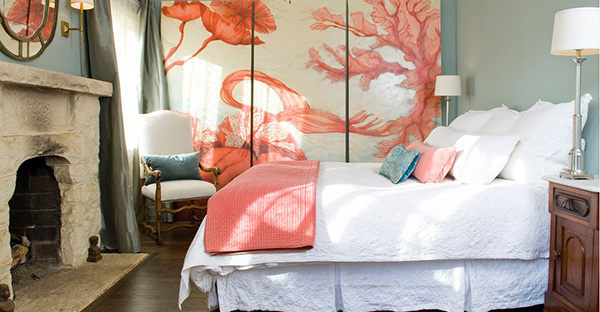 This coral panel wall art is sure to take the center stage of this bedroom design. 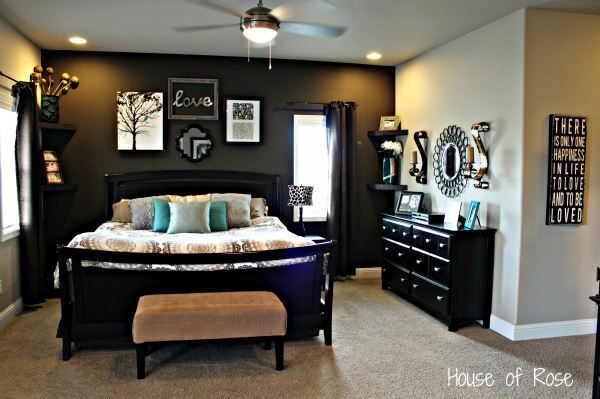 If you are looking for a theme bedroom for your son, this bedroom design is a great one! The wall mural with its personalized touch will definitely delight your kids. 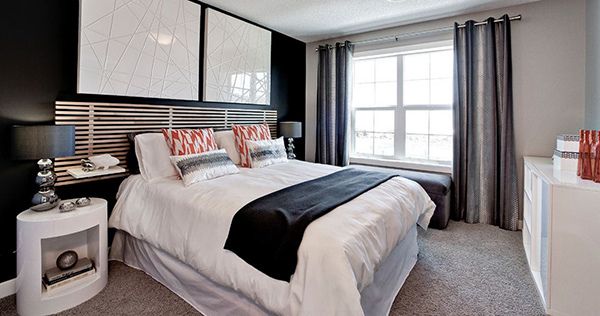 A great way to add texture and life to your bedroom wall is by using wall slats. The one shown above is the wood wall slats Piastra pattern by Soelberg Industries. Do you have artistic hands? If so, this design will appeal to you! Keep the place from getting dull by installing large framed whiteboards with art lights that can double as reading lights when you are not showcasing your artwork. 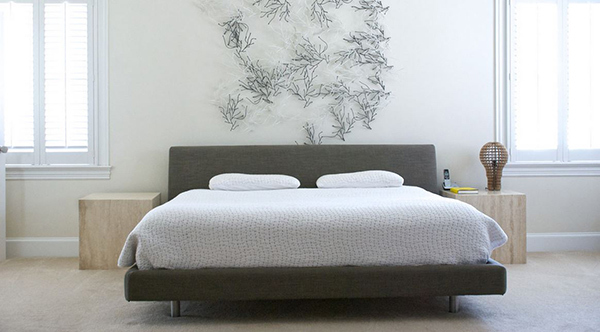 If you love creative pieces from nature, you could hang a wall sculpture like this on your bedroom wall. It will not only add texture to your interior, it will also add a modern flair to your space. This amazing wall art is from David Ward. Complement the colors and texture of your bedroom design with the wall decors that you want to add on your walls like this one. 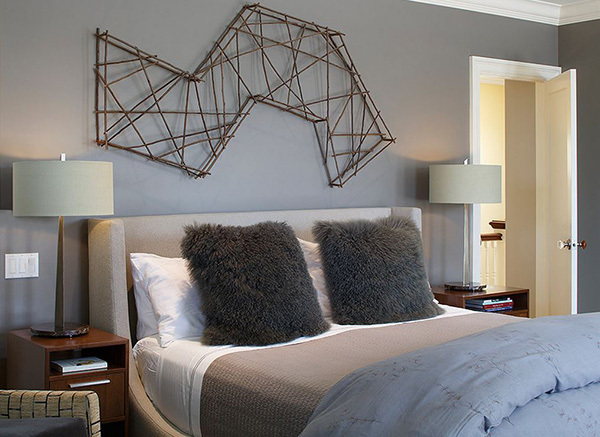 The wall decor above the headboard matches the area rug down below. It creates an inviting ambiance to the overall look of this room. 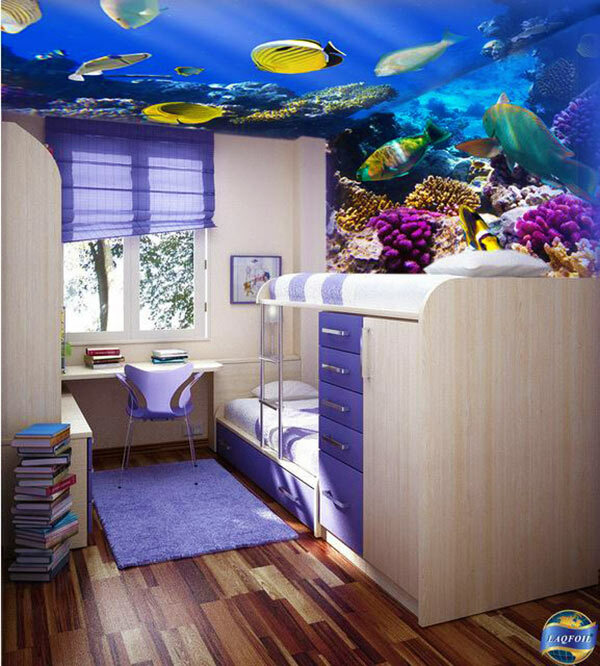 The Laqfoil stretched ceiling technology will definitely give your bedrooms a unique ambiance you have not experienced before. Collage framed art work can be an instant fun headboard design if you have a small bed with no headboard and a clean blank wall to begin with. Play with different frame sizes and colorful pictures to showcase to get this contemporary art appeal. I love the contrast that these small scale white blocks create against the jet black wall accent. It makes a playful interest in this bedroom design. 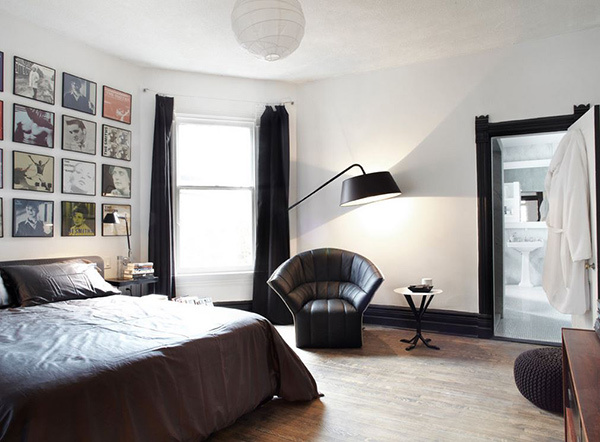 This masculine modern bedroom design was made retro with the framed albums on the wall from the owner’s favorite band. Going anxious on how to decorate your nursery for your little bundle of joy? Here is something you may consider when decorating your baby’s nursery. Go for bold colors and geometric patterns. Infants are drawn to high color contrast like the one you see above. 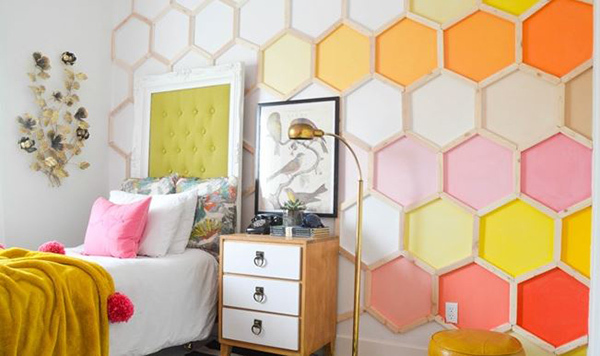 You will love this honeycomb hexagon wall treatment! This DIY is brilliant and will make your bedroom instant cozy and bizarre. Get an extra luxurious feel with this sparkling sculptural piece on your bedroom walls! It is fun to revamp your bedroom walls! Making it look different and getting the appeal that you like is fun and easy to do. Do not suffer from staring at your blank walls. Make it lively, vibrant and welcoming with the 20 Bedroom Wall Decorations! I hope I spark ideas to your creative minds. If you are planning to buy wall paintings, take a look at our tips first on how to buy and choose painting as wall decors. Let me know what decoration you like best.